This article originally appeared in the "Together Again" All-School Reunion, July 4, 1987 book. Central School served as an important influence on most of the young people in East Liverpool from 1895 until its demise in 1968. One individual was the guiding force over that building for more than half of its existence. 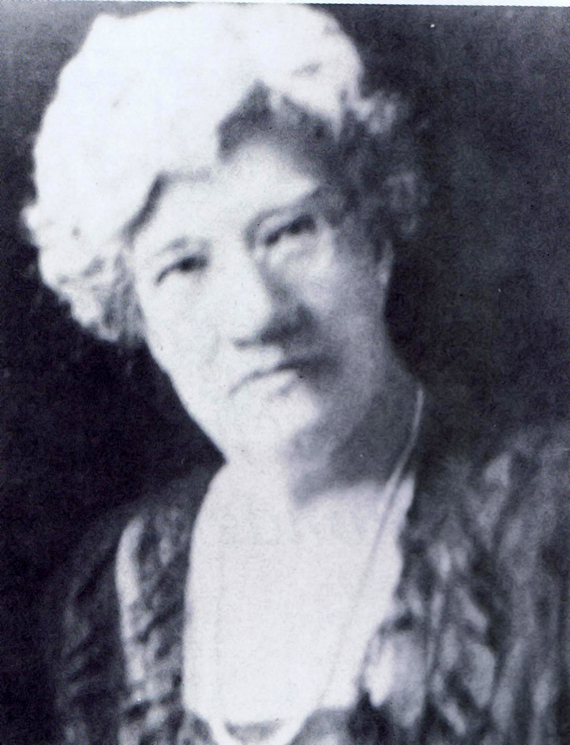 Florence Updegraff was that one individual who more than any other was the spirit and educational force in this community from 1891 until her retirement in 1927. After that she then served one term on the Board of Education. She was not a native daughter but completed her education here in the Union School which sat on the same lot as Central did. Florence was Valedictorian in 1878 and by 1880 was a full time teacher in the intermediate grades of the Union School. In 1891 when her good friend and mentor Euphemia Huston retired, Florence was appointed Principal of the Union School. The Updegraff family came to East Liverpool from Brillant, Ohio. Their father, Jacob, was a tailor. Their family consisted of father, mother, four sisters and three brothers. Two of the boys died in their early years. Only one sister married; Anna married George Shenkel. They had two sons; the father and both of the sons died as relatively young men. Florence Updegraff was certainly happy in 1895 when the new Central School was opened. For a year or so previous to that the Union School was crowded and the high school students were "farmed out" to other buildings in town. The late Dr. Sam Rich commented that he attended classes on the 2nd floor of the Odd Fellows Building at 5th and Washington Streets. Early reports have been confirmed by old timers now in town that Florence Updegraff was strict but very fair. She was held in great respect by all in the community. Present members of the community remember how as she walked out on stage and simply raised her hand, there was instant silence. Of course the members of the band sitting in front feared that at some time she would lose her balance and fall off of the stage. Individuals who were sent before Miss Flo, as she was called, did so with some concern. They knew they would be disciplined but that the discipline was always fair. Most individuals felt that one trip to her office was enough. Miss Updegraff seemed to have the ability to listen to all involved in an incident and determine just who was the "ringleader" and in turn determine what was just punishment for the infraction. One individual still in this area related about the time he was sent to her office for lack of effort on school assignment. He was told to sit at the desk in the outer office that she would discuss his problems with him later. After sitting and stewing for some period of time, the young man wondered what she would say or do. Just before lunch she came out of her office and turned to him and simply said that he may return to his class. After that "quiet" discipline, his grades improved greatly. He felt he had disappointed Miss Flo and knew he was a disappointment to his family. Another individual presently living in this community related an incident which showed the kindly protective side of Miss Updegraff. This individual had been crippled for some period of time and walked with braces on her legs. During the winter she lived in the East End with her grandparents rather than at her home in the Calcutta area. One particular day when there was ice on the walks she was concerned about getting to school. Her grandfather cleared a path for her to the street car. The trip to town was fine, but she had difficulty walking from 5th and Broadway to school at 4th and Broadway. She walked slowly knowing if she fell she would be unable to get up by herself. As she neared the alley by the Eagles and the present Kent State Parking lot, she noticed that Miss Updegraff came from the high school to her side and escorted her to the high school. During Miss Updegraff s tenure as Principal of the East Liverpool High School many changes took place. In the 1890's there were only 50 students in all of the high school grades. At her retirement in 1927 there were 170 in the graduating class-the largest in the history of the school up until that time. In the 1890's and early1900's in particular few boys finished high school. Many quit at age 12 or 13 to work in the potteries with their families. As school laws changed so that more boys remained in school, different programs were begun. As the enrollment expanded so did the class offerings and the extra school activities. Miss Updegraff promoted the idea of school athletics for boys and girls. The first high school band was started also during her years. During the 1920's a Ceramics Department was added so that our young men could learn some of the skills necessary to begin with decent jobs in the potteries. It was perhaps the close friendship of Florence Updegraff and Monroe Patterson which prompted him to build the football field in the west end and give it to the school district. Perhaps one of the more difficult periods of time was during the winter of January and February of 1915. It was at that time that the new white high school was built for $114,000. It was the responsibility of the teaching staff of the East Liverpool High School to complete classes on Friday in Central, pack up everything and have it in place in the new white high school for Open House on Saturday night and to begin classes Monday morning. Florence Updegraff was not only a good influence on the students in school, she also was an influencial member of the community serving in many leadership capacities in many different organizations. She was an active member of the First Methodist Church (now First United Methodist Church) teaching a Sunday School Class for women and serving on several church committees. It was largely through Florence's efforts that we had a YWCA for the young women in the community previous to the First World War. She was one of the founding members and also served as President of the organization. Again perhaps through Florence's efforts and influence, Monroe Patterson in the mid 1920's built the Mary Patterson Memorial Home in honor of his wife, Mary. It was originally built to provide housing and recreational activities for the women. No doubt Florence convinced him of the needs of the women. Miss Updegraff also served as President of the City Federation of Women's Clubs and during her term as an officer of that organization, the School Board and the Federation worked together to have the first school health nurse. She also served as President of the American Red Cross. During the war years, Florence Updegraff was on the Speakers Platform as one of the "Four Minute Men" who helped to raise money through the purchase of war bonds. The speakers were available to visit with and to speak to various organizations within the community. At her retirement in 1927, the Evening Review said of her "She was endowed with keen intellect; she possesses a rare personality. She had the tact of a diplomat' Continuing it said, "We marvel at the vast store of knowledge as well as her efficiency. Few educators can point to a record so brilliantly imprinted in the annals of time." Florence served one term on the Board of Education after retiring but chose not to run for re-election. In 1935 at her death, she was described as one of the town's greatest and most beloved citizens. More than 700 attended her funeral service. The plaque hung in the high school until the building was sold to Kent State University. At the present time the plaque is located in the Administration offices. Miss Florence Updegraff was truly the spirit of Central School. Yet several years after her death, it was noted that there was no tombstone over her grave. Several business men in town paid for and placed a tombstone in great respect for her. 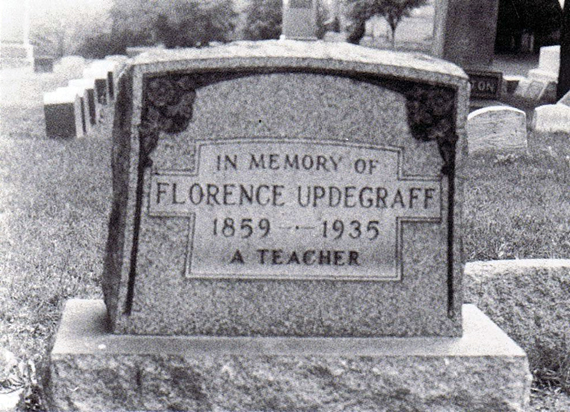 In fitting tribute the tombstone simply says, "Florence Updegraff, a teacher"